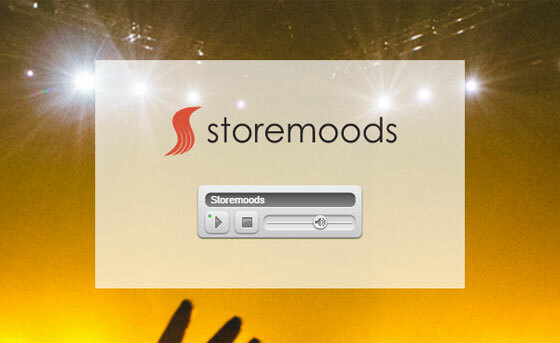 Features | Storemoods - This is how innovative Instore Radio works today! 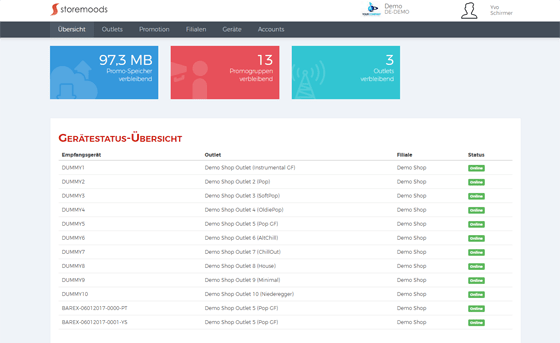 There is no need to decide on a music program at signup of your own Instore Radio. All music programs are included at no extra cost and are updated regularly resulting in multi-day playlist lengths. 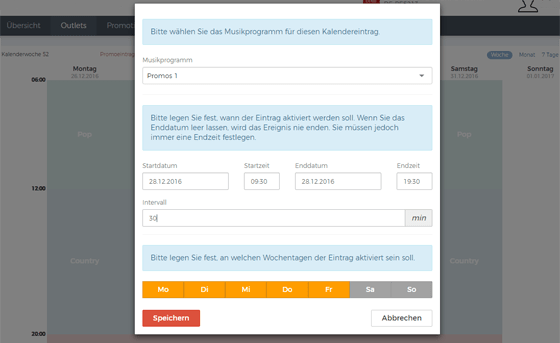 Using the graphical music calendar you are able to plan the music program of one or multiple locations efficiently well in advance. The active music program is then automatically played at the desired location without any need to manually switch between the programs. The Customer Portal is designed to manage a single or multiple locations remotely in no time. It is the place where you can upload promotional audio spots and add them to the schedule – if required many months in advance and separated by geographical regions or other relevant criteria. The clear dashboard gives an overview of the status of all connected locations. There is no need for the manager to be present at the physical location. An audio promotion can be scheduled easily in the blink of an eye. If required, you may use time and weather conditions to limit the playback of specific promotions to certain weather situations or time slots. Do you sell umbrellas and there is an unexpected heavy rainfall? Great! Our intelligent system will automatically activate your corresponding promotional audio spot and generate additional turnover. Never let your customers stand in the rain again. Our little in-store marketing assistant will take care of these repetitive tasks so you can focus on the creative ones. The possibilities of our cutting-edge promotional features are nearly limitless and suitable for for a multitude of use cases. We can’t wait to see yours! 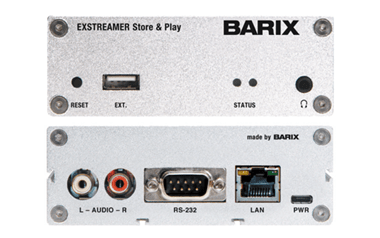 In order to assure an excellent music and reception quality, a cost-effective receiver can be used at every location. The content is streamed to the device over the Internet. For individual solutions we are also able to store the content on the device in order to enable offline playback. The device features an RCA connector for stereo audio and just needs to be connected to your sound system as well as the Internet. The receiver has no buttons and is solely managed through the Customer Portal. If you don’t have a sound system yet, please contact us. We will find a solution that suits your budget and sounds best with our services. If there is already a computer attached to your sound system, you may also tune-in to all music programs via the lightweight Web Player. The Web Player runs in every modern Internet Browser and needs no additional hardware except your computer. Since the Web Player only uses minimal resources, you may easily continue working while listening to your favorite tunes.